Photo/PAUK KRAJNYAK BELLAIRE’S Kaleb Pitchford has proven to be a steady blocker and ball carrier when called upon. He and the Big Reds will take on Johnstown-Monroe Saturday night at Maysville High School in Zanesville. ZANESVILLE — During his days working as an assistant for Roger Waialae at West Liberty University, Mark Spigarelli picked up many informative nuggets from the Hilltoppers head coach. One of them proved fruitful last weekend. “Just try to keep going,” Spigarelli said. “You have to just keep going until the next play. The lesson the third-year Bellaire High football coach took from his former boss paid dividends for his Big Reds in their opening playoff game against rival Martins Ferry. One week after being “embarrassed” by their longtime foes 34-0, Bellaire flipped the script. The Big Reds turned things around in every phase of the game and came away with a 14-7 victory in an Ohio Division V, Region 19 quarterfinal. The big play came with 2:35 left when Cole Porter returned a pass 35 yards for the winning score. After dominating the stats sheet most of the night offensively, only to be turned away, it turned out that a defensive play proved to be the difference. “It was one of those games where the team that made the mistake was going to lose, and that’s what happened,” Spigarelli said. Bellaire’s first playoff win in 12 years vaulted it into Saturday’s regional semifinal at Maysville High School. There, at 7 p.m., the Big Reds will tangle with mighty Johnstown-Monroe. The top seeded team in the region enters with a 10-1 mark after ousting Ironton, 15-7. “The kids enjoyed the win Saturday night and all day Sunday,” Spigarelli said. “We watched the film on how we played and showed them the differences in the two games (against Martins Ferry) and the strides we made. In the Johnnies, Bellaire will face a team that is big, physical and favors the run — a lot. J-M has amassed 3,927 total yards, all but 176 have come via the run. Senior quarterback Caden Calhoun (5-8, 158) is only 15 of 25 for 164 yards for the year with two touchdowns and two interceptions. His job mostly is to hand the ball off to a stable of backs that have accounted for 49 touchdowns. “They have a three-headed monster back there that will be tough to stop and they have a big, physical line,” Spigarelli said. Senior Bryce Barsch (5-9, 170) has 23 of those scores and 1,740 yards on 248 carries. Calhoun, himself, has carried the ball 140 times for 1,160 yards and 11 scores, while senior Luke Myers (6-2, 205) has 700 yards and 14 TDs on 98 carries. Senior Nick Curran (5-11) is the wing back. “They’re a good group of kids and they feed off each other well,” Carter said. The line is anchored by center Andrew Wingard, a 5-7, 220-pound senior. Juniors Wyatt Walton (6-4, 295) and Hunter Nickell (6-3, 190) are the guards, while seniors William Lewis (6-3, 255) and Zach Jenney (6-4, 230) are the tackles. Sophomore Jake Lusk (6-4, 215) is the Johnnies’ tight end, while sophomore Brandon McConnell (5-10) is a wide out. Defensively, Lusk and junior Stew Davis (6-4, 225) line up at end, while senior Josh Boso (6-3, 250) and junior Bryce Writesel (5-10, 205) serve as tackles. Seniors Tristan Bush (6-0, 185) and Kaden Davis (6-0, 216) start at linebacker. Davis is the team’s leading tackler with 117. In the secondary, Carter has seniors Trent Jakeway (6-0, 150) and Garrett Psurny (5-9), along with junior Cole Workman (5-10). The Johnnies lone loss came in Week 4 against Granville (10-1) a team which earned its first-ever playoff victory last week. J-M has defeated three teams with winning records. In addition to the victory last week, the Johnnies topped Licking Valley, 10-9, in Week 3 and Licking Heights, 21-7, in Week 9. Johnstown-Monroe, making its 11th postseason appearance, finished the regular season ranked fourth in the state Associated Press poll. The Johnnies have as 13-10 postseason record with a state semifinalist showing seven years ago. While Bellaire’s rushing numbers might not mirror those of the Johnnies, the Big Reds have a potent rushing attack led by junior Cole Porter. 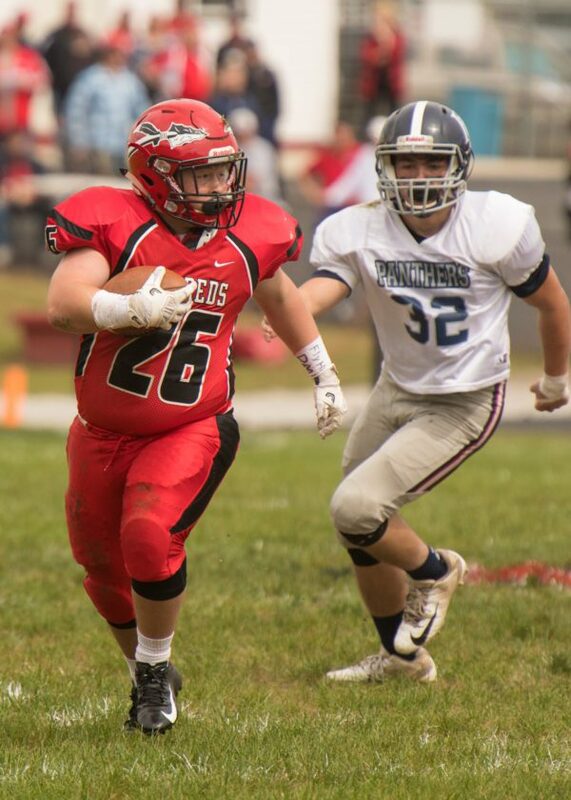 Porter, whose 1,581 yards is a single-season school record, continued his fine season against Martins Ferry with 160 yards on 31 carries and the Big Reds’ lone offensive score. “I think their offensive line does a great job blocking and their fullback is a very good athlete,” Carter said. Trace Sechrest added 45 yards on the ground last week, while quarterback Bobby Roth carried the ball 11 times. Kaleb Pitchford also spent time in the backfield. After being held to no passing yards the first time around against the Purple Riders, Bellaire was able to become more diversified last week. Spigarelli said it was a result of getting back to basics, somewhat, along with a reinforced effort from the players. Although Roth didn’t have what anyone would term a big night passing, he did craft some important completions — two of 15 yards or more — and connected with six different receivers. A.J. McCarthy, Sheldon Lakanudos, Trenton Wilson, Cole LaRoche, Porter and Sechrest all got into the act. “We just kept telling them all week that God had given them a second chance and you have to go out there and make it right. There’s only one way to fix it. That’s go out there and get a win. It’s playoff time and everyone is 0-0. Spigarelli said his players bought it, especially when situations looked dire. After a Bellaire turnover resulted in a long pass that put Martins Ferry on the cusp of the go-ahead score, the Big Reds’ defense came up big. Bellaire’s defense looked reborn from its performance a week earlier, something Spigarelli said came as a result of a renewed emphasis on the basics. ‘Spig’ was especially impressed with the work of his secondary, which struggled in the early going of the campaign. And Spigarelli knows it will take another strong effort by his defense to come out victorious this week. “I think (the players) are ecstatic to be in the position they are,” he said. “I told them the journey isn’t done yet. You have a great chance of knocking off a top team in Division V. I think they’re ready for the next challenge.